As followers of this blog know Brooklyn’s Green-Wood Cemetery is one of the great non-battle-related Civil War sites in the nation. Over the past decade cemetery officials have done the city, indeed the entire country, a great service by identifying and marking the graves of the thousands of Union and Confederate dead interred there. Many of these graves, and the stories of those buried in them, would have been lost to history if not for the efforts of cemetery officials and the volunteers who assist them. Walking the grounds one sees their work. 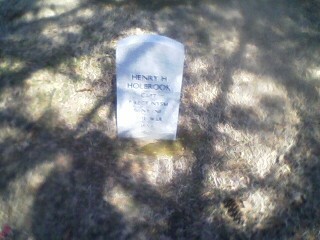 The cemetery also hosts a number of Civil War (and other) programming. Now Green-Wood Cemetery will play an even greater role in the war’s commemoration; earlier this week it was named New York City’s official Civil War Headquarters. The work that Green-Wood and other institutions are doing is more important than ever. Because of the state’s massive budget deficit, government officials have declined to fund an official New York State Sesquicentennial Commission. In contrast, Virginia has given $2 million annually for its sesquicentennial commission since 2008. Given New York’s budget woes, withholding funds makes sense financially. Nonetheless someone must fill in the breach and, thankfully, many institutions and individuals have. A cursory look at organizations planning Civil War related programming in New York City over the next fours years include: Green-Wood, the New-York Historical Society, the American Jewish Historical Society in cooperation with Yeshiva University, the public library systems, and of course the National Park Service’s myriad New York agencies. It is not just the city where events are underway. For instance, the New York State Military Museum in Saratoga Springs hopes to have a series of exhibits between now and 2015. There is much to highlight. 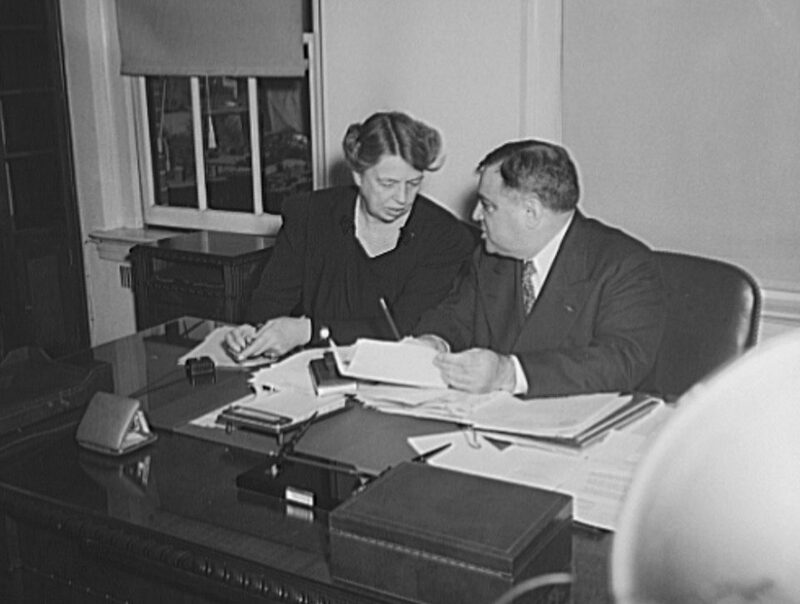 New York provided more troops to the war effort, 450,000, than any other state, ten percent of whom never returned. Many of the leading figures of the era also resided at least for a time in the Empire State, including Walt Whitman, John Brown, Harriet Tubman, George Templeton Strong, Secretary of State William Seward, and Frederick Douglass. In addition there are sites such as the Brooklyn Navy Yard, Elmira prison, and the factories that churned out much of the materiel for the war effort to remember and hopefully maintain. All of this is being done without the recognition of a state-sanctioned body. Thankfully a group of New Yorkers have organized to plan and coordinate these activities statewide. Even if no funds are forthcoming with luck Albany may give the New York State Civil War Sesquicentennial Commission its official imprimatur. Brooklyn-born sculptor Stanley Bleifeld has died. 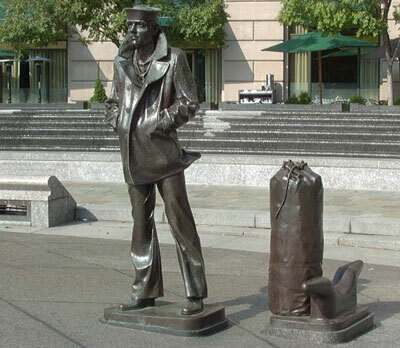 When we were in D.C. earlier this month we saw his “Lone Sailor” at the U.S. Navy Memorial near the National Archives. If you believe you have seen this elsewhere, you may be correct; copies stand in nearly a dozen cities across the country. The World War II navy veteran was equally renowned for “The Homecoming,” his tribute to the always emotional return of a sailor to port and family. A lifelong Brooklyn Dodger fan, Bleifeld executed “Pitcher” and “Catcher” at the Baseball Hall of Fame in the late 90s. This work depicts southpaw Johnny Podres throwing to Roy Campanella in game seven of the 1955 World Series. Bleifeld was active up to the end. Satchel Paige’s daughter Linda Paige Shelby unveiled Bleifeld’s homage to her father at the Hall of Fame in 2006. Just three years ago the octogenarian completed “It Seemed Like Reaching for the Moon.” This eighteen-piece tribute to the Civil Rights Movement in Richmond, Virginia was a fitting culmination to a varied and prolific career. Hey everybody, it is spring in New York and that can only mean one thing. 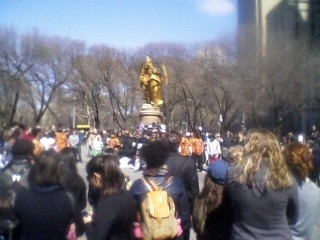 Yes, it’s Tartan Week here in New York. Because we do things bigger in the Big Apple the “week” will last thirteen days. Another round of Glenfiddich all around. In all seriousness, should you happen to be at Ellis Island this coming weekend be sure to see “A Celebration of Tartan” on the second floor of the museum. The exhibit, produced by the Clan Currie Society, will be on display Friday through Sunday. There will be singing and dancing throughout the festival and on Sunday April 3 the Rampant Lion Pipe Band will play. Here is a clip from last year. Hey everybody, it’s early Sunday afternoon. I just got back from a brisk walk in Green-Wood Cemetery. I was not there looking for Civil War graves per se, but with over 3,000 Union—and numerous Confederate—soldiers interred there it is inevitable that one will come across them. Above is Captain Henry H. Holbrook, an officer who survived the war, died several decades later, and now rests next to his parents here in Brooklyn. It is not a contest but I have always believed New York State had the greatest number of Civil War dead with 46,000 killed—more than 10% of the war’s total. This should not surprise us given that according to the 1860 census New York was the most populous state North or South. Pennsylvania and Ohio were the second and third most populous. There is an interesting piece in yesterday’s WSJ about current efforts to tally the Civil War dead. Such disputes have been going on since the guns fell silent and are likely to continue as more records are digitized and made available to scholars and the general public. Arguments like this are part of a larger phenomenon—all too human to our nature, I suppose—in which people’s claims to history come at the expense of others’. Most bitter regarding the Civil War have been the disagreements between Virginians and North Carolinians. Tar Heels have often felt short-changed by history, believing that Virginians, all the way up to Lee himself, have gotten credit as the expense of North Carolina. This is why we now call Pickett’s Charge the Pickett-Pettigrew-Trimble Charge. It’s important to work harder to better understand the Civil War and its meaning to us today. Still, one cannot read something like this without a small touch of amusement. I couldn’t let the 100th anniversary of the Triangle Shirtwaist Fire go unnoticed. It was one hundred years ago today that a fire in the factory of the Triangle Shirtwaist Company took the lives of 146 workers. Most of these were young Italian and Jewish immigrant women who had passed through Ellis Island in recent years. These women, teenage girls in some cases, lived in nearby Little Italy and Lower East Side and worked a six-day schedule making ladies’ shirtwaists for about $10 per week. The cause of death in many cases was not burning but asphyxiation and, tragically, trauma caused by victims leaping to their death to avoid the intense heat. Mayor Bloomberg and other dignitaries were on hand at what was then the Asch and is today the Brown Building at 29 Washington Place in Greenwich Village. There were also descendants of the Triangle victims present to pay their respects to their grandparents and great-grandparents. More lives would have been saved if the factory owners had not violated regulations by locking various doors and putting heavy equipment in front of others. The Fire Department responded quickly to the emergency but the factory was situated on the top floors, too high for the fire ladders. It was at this time, in a scene similar to 9/11 ninety years later, that onlookers saw dozens of victims jumping to their deaths. It was the costliest workplace mishap in New York City’s history and a quarter million New Yorkers looked on a few days later when 100,000 individuals marched in the memorial service. The public nature of the tragedy led to an outcry that spurred new employee safety regulations. Unfortunately I was unable to attend, but the Gotham Center for New York City History held a number of events this week analyzing and commemorating the event. This past Monday PBS’s American Experience aired Triangle Fire, which they will certainly air again. Home Box Office (HBO) is airing a documentary, Triangle: Remembering the Fire, through April. Check your listings. I opened the mailbox last night and inside was volume 1, issue 1 of The Journal of the Civil War Era. I spend more time than any man probably should watching old Civil War documentaries on Youtube. This four part documentary from 1958 focuses on the naval campaigns of the conflict. What I find interesting in these films is not only the information contained in them but the look, feel, and sound of the documentaries themselves. They are themselves primary artifacts in that they often tell us as much about their own era as they do the Civil War’s. Of course some day they will say the same thing about us and the sesquicentennial. I’ve always gotten a thrill from stories of recently found Long Lost Items. What I love is that by definition the discovery is unexpected. Someone is cleaning out the attic and comes across the love letters grandfather wrote to grandma from France all those years ago during the Great War. A guy goes to a garage sale and finds the long lost 78 recording of an old bluesman that musicologists thought no longer existed. Each discovery adds to the mosaic of our historical and cultural memory and gives us a deeper understanding our history. This week something extra special has surfaced: 3 ½ minutes of moving images of Babe Ruth and Lou Gehrig. And not just any moving images. The high quality footage was taken less than two weeks after the 1927 World Series when the American League MVP (Gehrig) and Home Run Champ (Ruth) were on a barnstorming tour. The 1927 Yankees are considered by many to be the greatest team in Major League history and both men were in their prime during this time. It’s snowing in New York today, but the regular season is a mere eight days away! I’m surprised this hasn’t gotten more attention than it has, but Tuesday is the 200th anniversary of the Commissioner’s Plan. Many people over the centuries have derided the scheme that organized Manhattan into geometrically precise streets and avenues as soulless and cold. I couldn’t disagree more. It’s hard to imagine New York City becoming the de facto capital of the world without it. 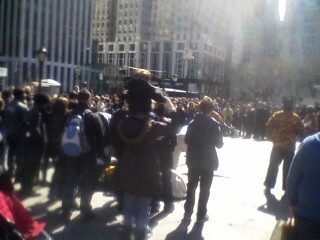 Until the grid most New Yorkers were clustered below Houston Street in a confused maze of streets and lanes. The Grid Plan facilitated transportation and trade, divided real estate into more easily salable parcels, and opened what were once woods and empty fields to residential and commercial development. The numbering system on the streets (1st Street, 2nd Street, etc.) was—and is—especially helpful to immigrants who otherwise could not have read the street names. The numbers tell the story. There were only 100,000 New Yorkers in 1811; a century later there were 4.4 million; today there are approximately 8.2 million souls drawn to New York’s intellectual, financial, and cultural allure. 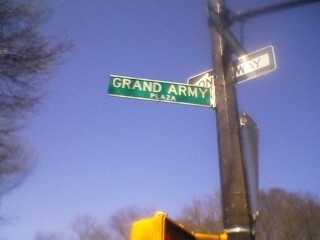 Ask most Brooklynites where Grand Army Plaza is and they will give you an answer, even if they have no notion of what Grand Army the plaza commemorates. It is the area just before the entrance to Prospect Park, where Flatbush and Eastern Parkway divide. One passes it all the time on the way to the greenmarket, the central library, the museum, or the botanical garden. The other day I was in Manhattan on some non-Civil War related business when I came across the “other” Grand Army Plaza, the one virtually no New Yorker, however proud, would be able to identify as such. 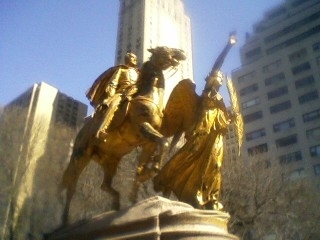 I intend to do a more systematic series of posts on Civil War statuary in New York this spring and summer but couldn’t resist sharing a few snaps I took on the last day of winter 2011. 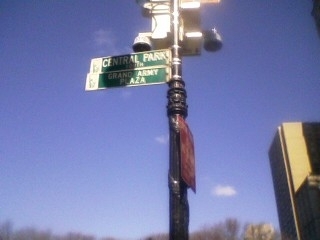 The plaza is at the corner of Fifth Avenue and Central Park South. 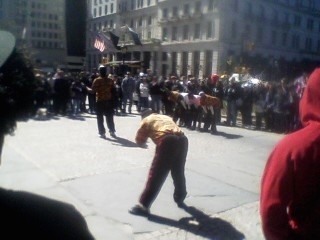 It was a crisp, bright day and there was a sizable crowd watching some street performers. 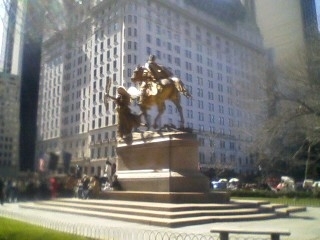 In the background is the General Sherman statue. 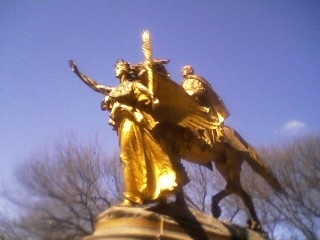 Augustus Saint-Gaudens designed the statue. 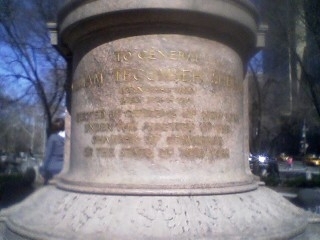 Charles McKim, a frequent collaborator, built the pedestal. Most famously the two worked together on the Robert Gould Shaw Memorial which sits in Boston Common. When I was in Washington two weeks ago I saw the plaster mold that the National Park Service has loaned longterm to the National Gallery of Art. One can see the similarities. Whatever the season this area just outside Central Park is always a happening spot. 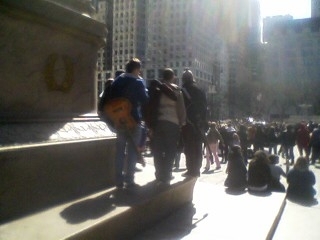 That’s the Plaza Hotel in the background. 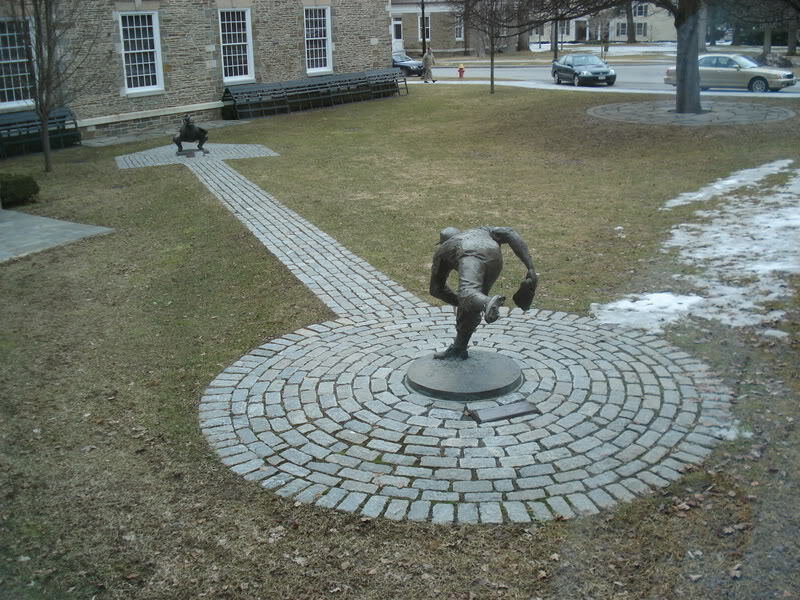 One reason the statue works so well is because it fits proportionally into its surroundings. Saint-Gaudens and McKim hoped to put the work just outside Grant’s Tomb, but Sherman’s family disapproved. The tomb and this statue are both representative of the City Beautiful movement. 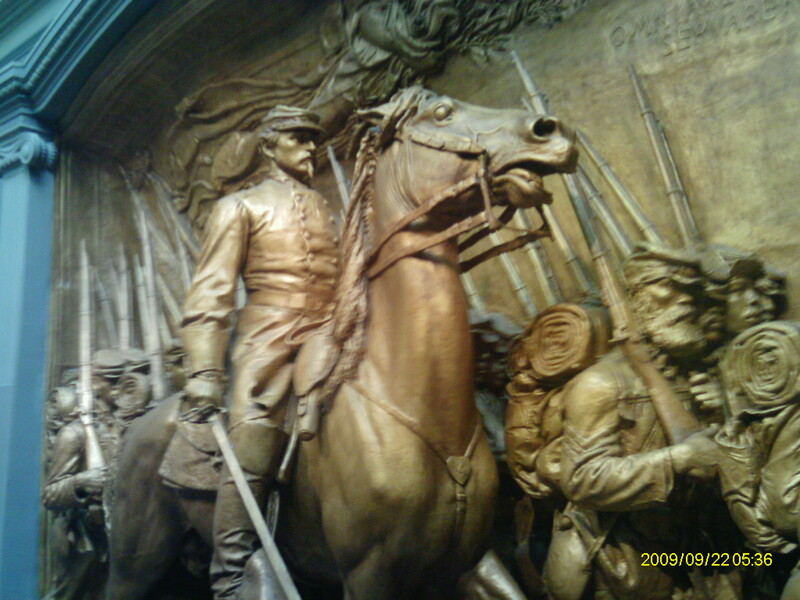 Saint-Gaudens’ final masterpiece was dedicated in 1903, six years after Grant’s mausoleum. I often wonder if the men and women of the Civil War era could have imagined the multicultural twenty-first century America they helped bequeath to us.